Blend two PLA filaments of any color by using the new dual-feeding, single extruder module. The filament meets at the tip, extruding and retracting when necessary based on the settings done in XYZware. Experiment with different filament color types to create new and exciting colors. You can choose from "Multicolor Mode" and "Mixer Mode" in XYZware. Choose different colors and the software will set them proportionally in varying tones. Split color blocks according to the height. Each block contains single color or a set of gradation color blocks. The da Vinci Jr. 2.0 Mix uses an intuitive 9-point calibration detection system that accurately determines the distance between the extruder and the print bed. This ensures that you can start printing right away at the best quality possible. Print directly from your computer in your local area network. Downloading FREE 3D models available from our online XYZ 3D Gallery and mix the color to unleash your creativity. Built-in SD card makes for faster and more convenient printing. All XYZprinting PLA filament spools are a biodegradable plastic that is recyclable and safe for the environment! 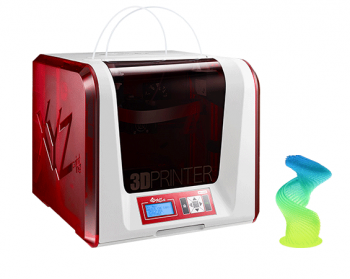 With its compact design, This eco-friendly 3D printer makes sure that nothing goes to waste.